Listing courtesy of Tina Marie Hare (CalBRE #01062657), Century 21 Everest. 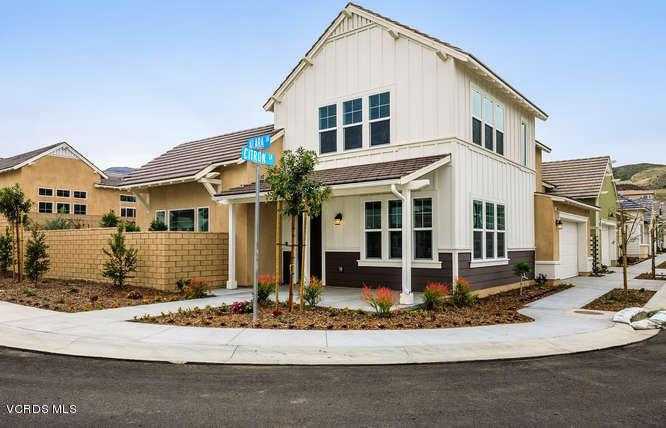 Welcome to this stunning 2 bedroom, 2.5 bathroom, 1,617 sqft single story plus loft home in Verano, an exclusive 55+ Active Adult community in prime Santa Clarita location. Step onto the charming front porch, and open to wood plank floors, designer paint, and energy efficient recessed lighting. Chef’s kitchen has bright white cabinets, gorgeous white granite counters, huge island, and GE stainless steel appliances. Adjacent formal dining room is nicely sized for hosting. Desirable floor plan has first floor master bedroom, powder bath, and laundry room. Beautiful master bath has dual vanities along with ADA compliant oversized walk in shower. Upstairs loft and bedroom is great for guests with plush designer carpet. Hall bath has tub/shower combo. The landscaped private backyard has plenty of room for your outdoor table, garden, and grassy area for furry friends! Verano offers an award winning private clubhouse that includes pool, spa, bbq area, workout facility, wine storage, and endless options for community activities. Don’t miss this fantastic opportunity to own a brand-new move in ready home! Call for a private showing, or come by the Block Party on February 9th to take a tour, grab a bite, and meet members of the community. Welcome home! Building size: 1617 sq ft.